Native plants. The term has different meanings for different gardeners. There are Texas natives, US natives and those plants that act like natives. All in all, what most of us want in our garden are low maintenance plants that are attractive and functional. Plants that are not invasive and are a benefit to wildlife. When you plant a garden, it is not just for you – it is a habitat for all living things around you. So with that in mind, here is our list of 10 native plants for Houston that do just that. Many are heat and drought tolerant – cheerfully returning year after year in your garden. 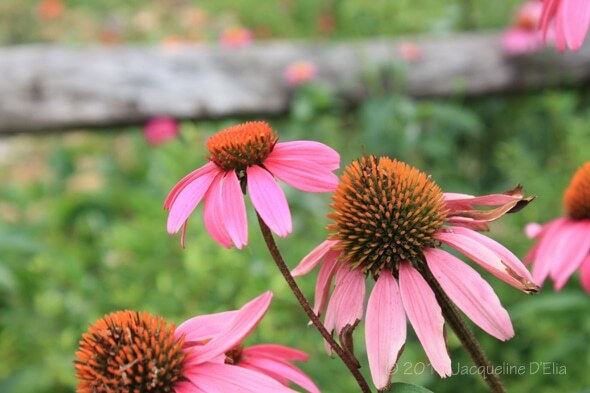 1Eastern Purple Coneflower (Echinacea purpurea) – Drought tolerant native that is a butterfly magnet. Profuse blooms spring through summer. Elongated stems with soft lavender petals attached to an iridescent cone. It prefers full sun to partial shade in well draining fertile soils. 2-5 feet tall. Perfect for cut flowers, lasting about a week. NATIVE. Outstanding performer in the garden. 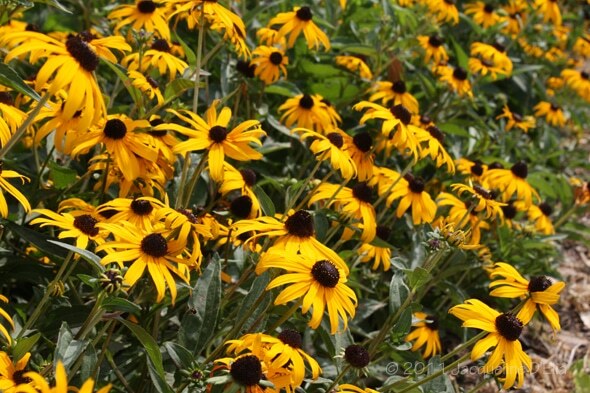 2Black-eyed Susan (Rudbeckia fulgida ‘Goldsturm’) This perennial coneflower has cheerful golden yellow flowers with black centers that offer long-lasting continual blooms. A drought tolerant perennial with large blooms up to 5 inches across that make great cut flowers. A sure winner for a Houston garden. NATIVE. 3Inland Sea Oats (Chasmanthium latifolium) – Native to the US. This is a shade loving perennial grass with oak-like flower spikelets and a clumping habit. Low maintenance and known for it’s large graceful seed heads and blue-green bamboo-like leaves. Soft brown color during most of winter, by February you can cut it down at the base and it will grow again in spring. Good for controlling soil erosion. NATIVE. 2-4 ft tall. 4Southern Wax Myrtle (Myrica cerifera can also be referred to as Morella cerifera) This multi-trunked, evergreen shrub can reach 20 ft. in height. 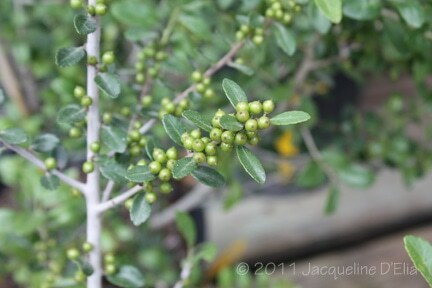 Light olive green foliage with a spicy fragrance. Female plants produce pale blue berries in the winter. There are separate male and female plants so if you want berries, you’ll need to have a male plant nearby. In colonial times, the fruit’s waxy covering was used to make fragrant candles. Makes an excellent screen plant for shielding areas from view. Prefers moist soil and full sun to part shade. Attractive gray bark. NATIVE. 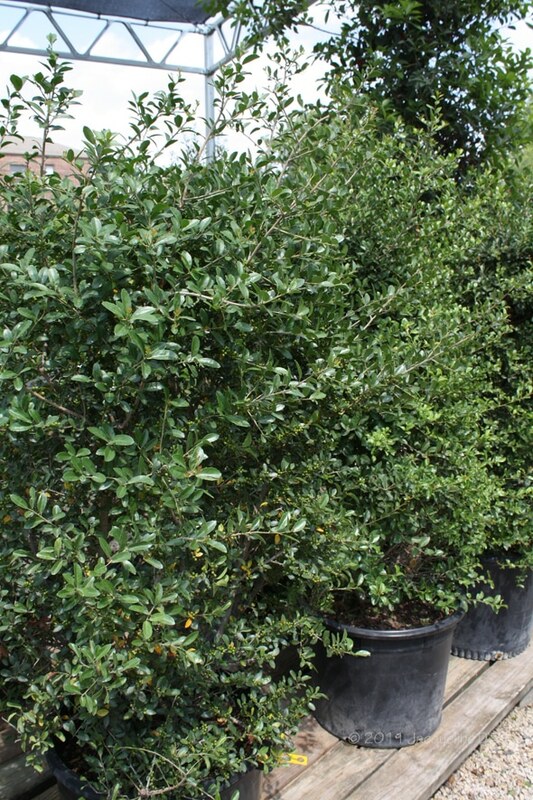 5Pride of Houston Yaupon Holly (Ilex vomitoria) Nice upright single or multi-trunk small tree. Small dark green leaves with a pale gray bark with white blotches. Female plants have attractive red berries in winter that are good for wildlife. They also make lovely holiday displays. You’ll need to have a male plant nearby for the female to produce berries. Drought tolerant. Takes full sun to shade, but produces fruit best in sun. Pride of Houston is an improved variety of the NATIVE YAUPON. 12-25 ft tall. 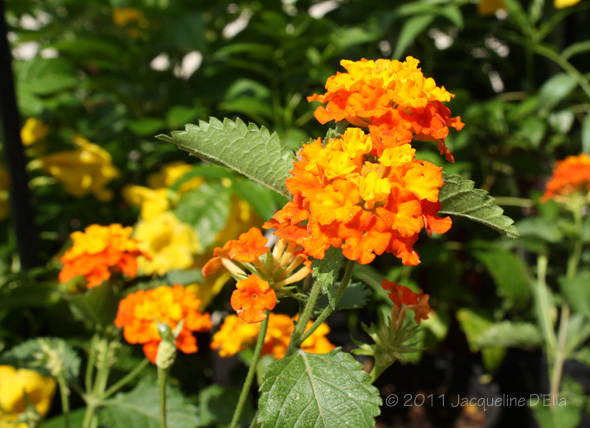 6 Texas Lantana (Lantana horrida also referred to as Lantana urticoides) – A native to Texas, this variety of Lantana has yellow to orange flowers that is attractive to butterflies. Very drought tolerant as well as salt tolerant. Deer resistant. Hardy in our zone 9 (may need some protection in severe winters) Prefers well draining soil. Full to part sun. Spreading shrub 3-6 ft. Blooms all summer long. NATIVE. 7 Red Turk’s Cap (Malvaviscus arboreus var. Drummondii) – A native shrub of Texas and Mexico, it is also known as Drummond wax-mallow. This spreading 2-3 ft tall shrub prefers shade to part shade. Bright red hibiscus like flowers with overlapping petals that never fully opens to form a column for the stamen to protrude. Flower resembles a Turkish turban hence the name Turk’s cap. Very useful for shady spots. 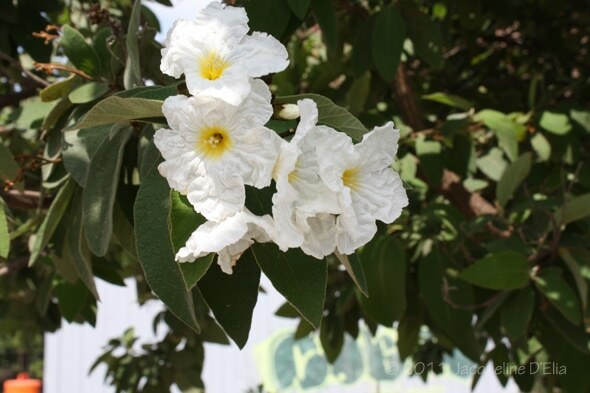 8Texas Olive (Cordia boissieri) Wonderful fast growing native tree with ever-blooming large white flowers. You can see these in person at Buchanan’s. There are two large ones planted on the west side of the parking lot. They are blooming now. Drought tolerant once established. Produces purple fruit edible for wildlife. Grows about 15 ft tall and has about the same size spread. NATIVE. 9Autumn Sage (Salvia greggii) This traditional cottage garden plant flowers constantly from late spring until hard frost. Drought tolerant tough perennial that prefers full to part sun. Grows about 3 ft tall and as wide. Red flowers with a pale green small leaves. A good food source for hummingbirds! 10Gulf Coast Muhly (Muhlenbergia capillaris) Tough native perennial grass with a large, airy seed head that grows about half as tall as the entire plant. The spikelets are purple and in fall the plant takes on a feathery, deep pink hue. Perfect for mixed perennial beds, specimen plant or in a meadow. When planted en masse – it adds graceful soft movement in the garden. NATIVE. Full to part sun. Clumping habit 2-3 ft. tall. Many gardeners neglect planting grasses in their beds in an effort to focus only on flowering plants. Most of the gardens I’ve seen that are truly breath-taking incorporate grasses into the design. They’re a place for your eye to rest in the landscape and help your flowering perennials stand out. This list is some of our favorite native plants, and there’s lots more that are suitable for Houston area gardens. Want to learn more about native plants? Come to Buchanan’s. If you want a low maintenance, beautiful garden – start with natives. It’s not too late to plant. Visit Buchanan’s Native Plants today and our native plant experts will help you pick out the right plants for your garden. Jackie D'Elia loves gardening and photography. Her day job is building amazing things in WordPress at Jackie D'Elia Design. She earned a BS in Horticulture from Texas A&M. Follow her on Twitter @jdelia.